Answer: Being able to refinance will depend on the amount of time that has passed following the foreclosure, the amount of credit you’ve been able to build in the meantime, and the lender’s mandatory requirements. Fortunately, lenders are becoming more forgiving about credit mishaps and it’s becoming easier to recover from events like foreclosures, short sales and bankruptcies. Foreclosures and short sales will sit on your credit report for seven years, but you can still rebuild in the meantime. When evaluating credit-worthiness, some lenders are more concerned about what you’ve done since the delinquency, and look for indicators that you’ve taken steps to correct your past indiscretions. Many lenders require people to reach a minimum credit score to be considered for a loan, so check with the lender to see if you’re within that range. If you’re not, continue to improve your score by using credit responsibly and monitoring your reports each month. 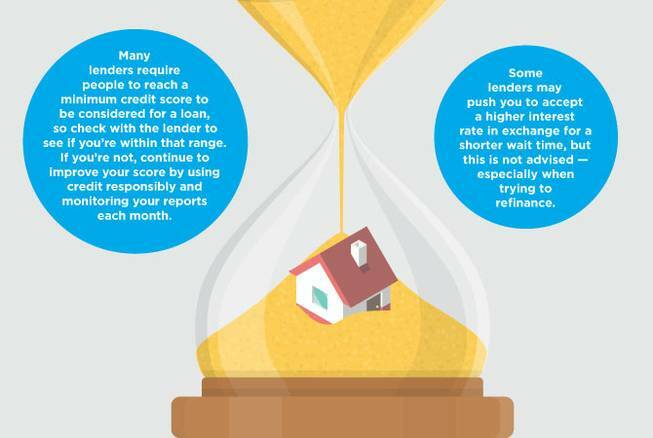 If you are within the minimum credit score range, you’re one step closer to being able to qualify for a refinance, but you may not be out of the woods yet. Depending on the lender, there are varying mandatory timelines you have to follow before applying for a loan. The minimum, mandatory “seasoning period”­­— the amount of time following a foreclosure/short sale that you must wait before applying for a loan ­ — is generally two years. That is, if you have the cash to put down. The waiting periods for conventional loans granted through Fannie Mae/Freddie Mac vary depending on how much you’re able to put down (or, how much equity you have in the existing loan). For refinancing, lenders calculate your loan-to-value (LTV) ratio. Occasionally, Fannie Mae and Freddie Mac offer exceptions to the seasoning period requirements, but you’ll have to prove that the default on the past loan occurred under extenuating circumstances, and supply a reasonable argument that it won’t happen again. In some cases, Federal Housing Administration loans don’t require a waiting period following a foreclosure or short sale. You may not have to wait if you were not in default at the time of the short sale and you were up-to-date on your payments for at least 12 months prior to the short sale. However, if you defaulted on the mortgage at the time of the short sale or if you were foreclosed on, the waiting period is generally three years until you’re able to apply for another FHA loan. The three-year waiting period can be overridden in some circumstances. If there was a serious illness or death in the family that affected the household income during the time of default, or sudden job loss, you may be able to argue the circumstances leading to the default were extenuating as well. Further, while the FHA may agree to insure the loan, it’s ultimately the lender’s decision whether to approve it. Many loans through Fannie Mae and Freddie Mac are granted with an FHA loan approval, but other lenders may be more apprehensive. There are government-backed programs offered to veterans that can help them apply for a loan with a short wait time. Most VA loans, offered through the Department of Veterans Affairs, have a two-year waiting period, but sometimes it can be as short as one year, depending on the circumstances. Private lenders often follow Fannie Mae and Freddie Mac wait-time guidelines, but they also may be more flexible, depending on what you’re able to put down. A high down payment, over 20 percent, may be required to bypass wait times. Note: Some lenders may push you to accept a higher interest rate in exchange for a shorter wait time, but this is not advised — especially when trying to refinance.